I am a HUGE proponent of taking progress pictures, even though I hate it. And when I say hate, I mean despise, dislike, loathe, and shudder; that is until I get to look back at them. Suddenly I love them, muffin top and all. On August 23, 2010 I started working with Joe. He asked for progress pictures and I immediately panicked. The one of the strangest conversations I have had with my husband to date ensued. DL – Uh….apparently I have to send the man named Joe progress pictures. How do I do that? Jon – I take ’em, you send ’em. DL – Well, ok then. Jon – Donloree….don’t you think you should wear….uh…LESS for these pictures? DL – LESS?! Why? I think this fine…. Jon – Donloree. You are going to stand on a stage on a bikini…somehow I don’t think Joe has x-ray vision to see through all your clothes. Put on the bikini and let’s try again. DL – *gulp* You mean the muffin top-alicious bikini?! Jon – Exactly. Go get it on babe. I flexed as much as womanly possible and executed the worst posing imaginable. I was trying REALLY HARD. For the next eight weeks, I had to send Joe weekly pictures. Still awkward, but way less deodorant was required as the weeks went by. I also got better at posing; thank goodness! Last year I walked on the stage 10 pounds heavier than I would have liked to, but I did it knowing that October 16, 2010 was the starting line for me. I went through my first prep the hardest way possible; learn by doing everything wrong and making very late, mid-course corrections. Then the year of pure hell with my health happened. My goal was to compete in the Spring of 2011, this did not happen. Nor did competing this Fall happen. I have suffered through extreme anemia that has caused a HOST of problems including thyroid issues, adrenal insufficiency, autoimmune challenges, estrogen and progesterone fiascoes, and other random ridiculousness. Obviously dieting for a competition was not a good idea. What it did mean was the most focussed ‘off season‘ you can imagine. For the last year I have recorded every calorie that I have eaten, trained like a mad woman, and worked hard to get my health back. Many excuses to give up have presented themselves, but I have tried not to take any of them. There was nothing ‘off‘ about this off season. I’ve seen great gains in my health and gotten some good news from the doctor over the past few weeks. I have also been feeling happier, more energetic, and ready for what’s next. I’m also 20 pounds heavier than I was a year ago. The focus of training and eating has been two fold – health and muscle growth. Left is Sept 2010, right is Sept 2011. I see some changes and, heck, I think there is a back growing! I am at a crossroads and not sure which path to take. Pick a show and start dieting. Keep the momentum going and trying to stack on every ounce of muscle possible in the next 6 months. Set small, slow weight loss goals while trying to still build muscle. This time I am working in tandem with the advice of my coaches; we will see what they have to say and I will make a decision. What I like most about all these options is that they all lead to greatness, the scenery along the way is just different. I can’t see the back picture 🙁 Those sound like great goals! I cant see the back picture either. Those are some great pictures, and you can definitely see progress. I’m just in awe of people who compete, and I think it shows in your great attitude – how all your goals “lead to greatness, the scenery along the way is just different”, and in how you don’t let anything stand in your way. Love the progress pics! You’ll have a new goal soon enough, and I have no doubt you’ll approach it with the same zeal and positive attitude you approach everything in life. Can’t wait to see what the next 365 days bring! Me either – for both of us!! Girl, look at those guns!!! Dang that is some muscle you have put on this year, your shoulder caps are nothing short of AMAzing. Glad you are feeling better and ready to tackle a new goal, keep us posted (I know you will, cuz you RAWK) I know you will succeed and inpsire along the way to whatever it is you decide!! Thanks lady!!! Here we go!!! well i think the question is..based on how you think you dieted and trained for the past year…which goal are you leaning on most? only YOU know your body. i would like for you to make smaller goals just cause i know that how difficult it has been for you. (ok well my real personal goal for you is for you to gain muscle in the next 6 weeks..not cause i’m a muscle junkie, but cause i dont think you’re comfortable yet choosing a show). No, seriously, really glad Kathleen mentioned you. I am going through something similar minus the ridiculous health issues you’re going through, to which I am deeply sorry about. I am, however, going in for my 4th blood work this year (I feel like I should be compensated somehow with some small consolation prize, like a medal, or something). Had one as a precautionary thing. That Dr’s office likes to be thorough and meticulous. 2nd & 3rd were due to elevated enzymes in either the thyroid, or kidneys, both came back negative after (possibly due to over training and dieting over the years??). This one serves further as a precautionary PLUS an added bonus of checking for Lyme Disease. 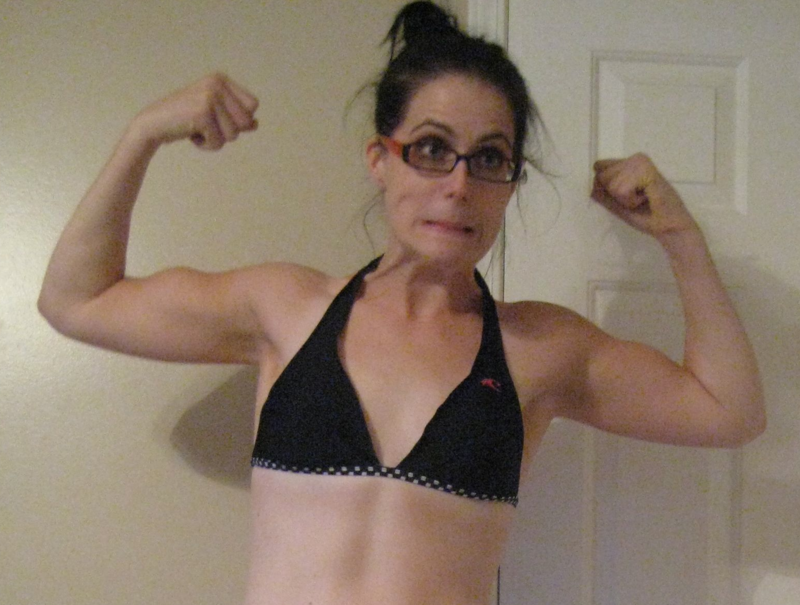 :o) I’m go about 10 to 15 lbs over my WALKING weight, let alone competition weight. From my 2nd to last I’m over 20. Frustrating. Maybe we can help each other out with this massive conundrum? ?